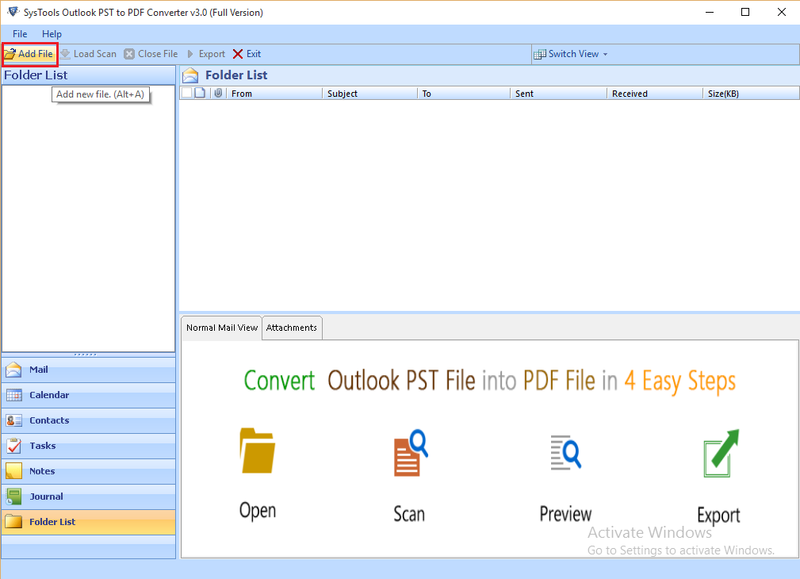 Convert your PST file emails into PDF format with enclosed attachment which software keeps intact even after conversion. Once application completes its major role, a user can export the data at a desired location. What PST to PDF Software does? PST file to PDF is an advanced tool, which provides the complete solution to convert PST data like emails, contacts, calendar, task, and notes to PDF file format. The software also converts email attachments via embedding them within the newly created PDF file. Quick : For low level corruption issues. Advance : For high level corruption issues. 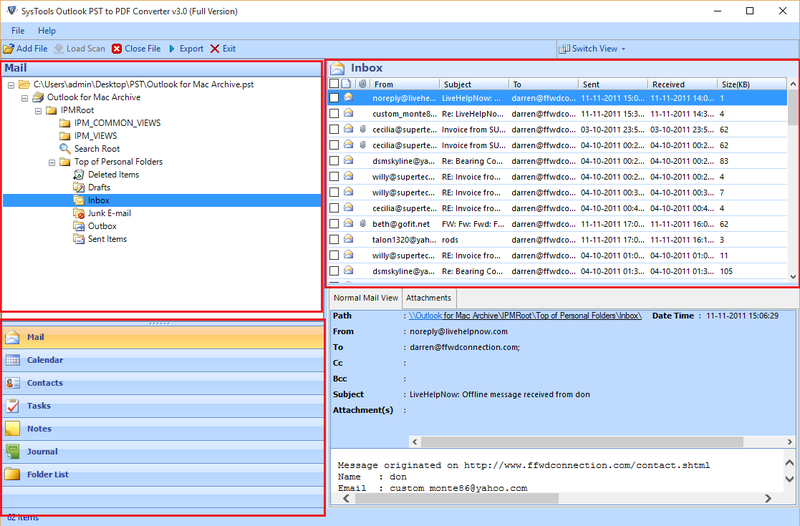 Preview PST data with Attributes like sender's details, received date, etc. The software provides effective preview options to view PST file data. Users can view complete PST data like emails, contacts, task, notes and calendars with their attributes, for example; view emails with their attachments, sender details, received date, etc. After viewing PST data, users can convert selected items like; selected emails, contacts, calendar, notes, task and journal in the Adobe PDF file format. Select required items. Right click to choose Export pop-up and convert the selected data into PDF file format. Users can convert multiple data from PST file to PDF. 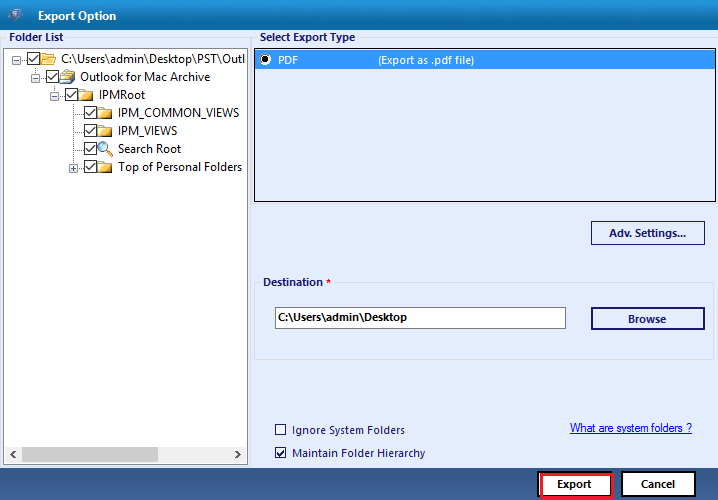 Click on the Export button and after that, a pop-up window appears namely Export option. Now select and un-select multiple folders to convert PDF file format. By using this option, users can convert multiple selected folders to Adobe PDF file format from PST. PST to PDF converter provides multiple naming conventions to save converted PST emails as PDF file format. Therefore, users can select as per requirements from these naming options; "Subject", "Subject+Date(DD-MM-YYYY)", "From+Subject+Date(YYYY-MM-DD)", "Date(DD-MM-YYYY)+From+Subject", and many more. By using, the naming conventions option users can effectively distinguish the output. The software provides effective preview option to view PST file items. Users can easily view complete emails before the conversion and rearrange them by attributes like sender name, received date, subject wise, size wise and sent date wise etc. The software provides option to save converted PST file data into PDF format at your preferred location. If users want to save, converted data in the new folder, then software provides the option "Make New Folder" to save PDF files. I have tried free version of this application and now looking for a way to upgrade it? How it can be done and how much time it takes to get upgraded? Simply, place an order for upgrade and your demo version will be updated to licensed version. Off-course yes, this application is utterly compatible with Windows 8 environment. As you know, attachments are the important for me. Is there any way to convert them too with emails into PDF? Yes, there is a way. 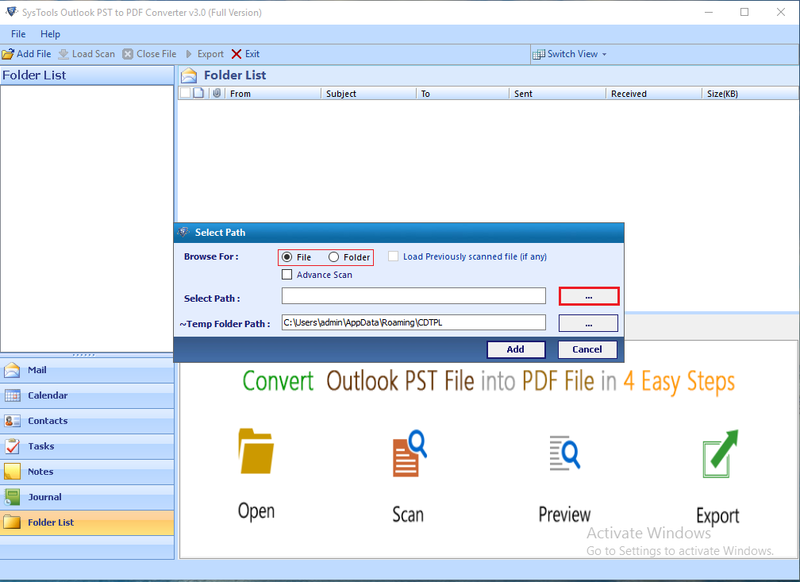 While converting PST emails into PDF file format, you will be able to access the respective attachment. Actually, software just embeds all the attachments related to a single email with it in resultant PDF file. Just click on "Paper Clip" icon and adjacent attachments to an email will open shortly. What kind of PDF this software produces (Searchable PDF or Flat PDF)? Searchable one. So, user can search and go through the entire PDF file to pull-up the required information. Is that possible to convert multiple PST Files at once? No, this application performs conversion on a single PST file at a time. 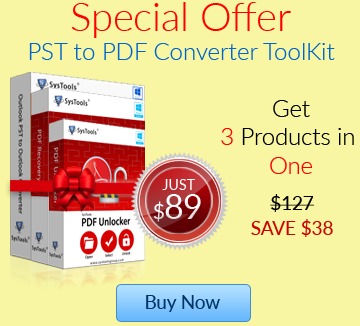 Will the single PDF file contain all data or PST to PDF Converter produce single PDF file for each Item? Software generates PDF file for each items whether it an email, contact, note or anything else. 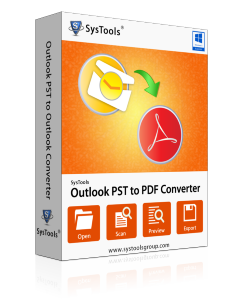 I got this PST file to PDF converter tool and converted PST file to Adobe PDF format. By using this conversion tool, it becomes easier to convert entire PST file emails, contacts, calendar,etc. into PDF file format. Few months back, I needed to create separate PDF files for all PST emails. Then I tried many solutions like Adobe Acrobat, Print options but these methods did not help me. My friend suggested me this tool. Thanks PST to PDF converter for making my emails accessible for me independently.